Lady Quince Winthrop had always known she was the unfortunate sort of lass who could resist everything but temptation. And the man across the ballroom was temptation in a red velvet coat. There was something about him—some aura of English arrogance, some presumption of privilege—that tempted her beyond reason, beyond caution, and beyond sense. Something that tempted her to steal from him. Right there in the Countess of Inverness’s ballroom. In the middle of the ball. Which was entirely out of character. Not the stealing—she stole as naturally as she breathed. But because the other thing that Lady Quince Winthrop had always known, was that the most important thing about stealing was not where one relieved a person of his valuable chattels. Nor when. Nor how. Nor even what particular wee trinket one slipped into one’s hidden pockets. Nay. The tricky bit was always from whom one stole. When one robbed from the rich, one had to be careful. Pick the wrong man, or woman for that matter—too canny, too important, too powerful—and even the perfect plan could collapse as completely as a plum custard in a cupboard. Which made it all the more curious when she ignored her own advice, and picked the wrong man anyway.Whoever he was, he stood with his back to her, his white-powdered hair in perfect contrast to that red velvet coat so vivid and plush and enticing that Quince was drawn to it like a Spanish bull to a bright swirling cape. Unlike the gaudily embroidered suits worn by the other men, the crimson coat was entirely unadorned but for two gleaming silver buttons that winked at her in the candlelight, practically begging her to nip one of the expensive little embellishments right off his back. A button like that could feed a family of six for a fortnight. And while her itchy-fingered tendency toward theft was perhaps not the most sterling of characteristics in an otherwise well brought up young Scotswoman, no one was perfect. And it was so very hard to be good all the time. She had much rather be bad, and be right. So Quince took advantage of the terrific crush in Lady Inverness’s ballroom, slipped her finger into the tiny ring knife she kept secreted in the muslin folds of her bodice for just such an occasion, and sidled up behind Crimson Velvet. She did not pause, nor give herself a moment to think on what she was about to do. She ignored the chitter of warning racing across her skin, and set straight to it, diverting his attention by brushing her bodice quite purposefully against his back, while she nipped the button off as easily as if it were a snap pea in a garden. The elation was like a rush of blood to the head—intoxicating and addictive. And because that was what she did—regularly stole fine things from finer people in the finest of ballrooms—she wasn’t satisfied with only the one button. Nay. Another six mouths could be fed, and Quince could live all week on the illicit thrill of having taken the second button as well, and gotten away clean. Except that she didn’t get away clean. She didn’t get away at all. A very large hand clamped onto Quince’s wrist like a shackle. A red velvet-clad hand. Alarm faded as recognition, and something that really oughtn’t be delight curled into her veins. She knew that deceptively easy tone. Strathcairn. Earl thereof. She had clearly not recognized him. 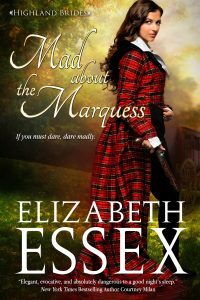 But the man gripping her wrist was neither the powdered dandy she had imagined from across the ballroom, nor the amusing, carefree Earl of Strathcairn she remembered. This man was different, and as dazzling in his own way as the shining silver buttons she had secreted down her soft-pleated bodice. Firstly, he was as irresistibly attractive as that red velvet suit—all precise, well-cut shoulders, and long lean torso that seemed a far cry from the rangy, not-yet-fully-formed man in his youth. But secondly—and more importantly—he was much more controlled, more…curated, as if he had carefully chosen this particularly splendid view of himself to show the world. As if he not only wanted, but demanded to be seen. Quite the opposite of Quince, who minded her appearance only to make sure she blended into the crowd—if her sister told her this season everyone was wearing white chemise dresses, then a white chemise dress she wore, disappearing into a sea of similarly dressed swans. By contrast, Strathcairn looked every bit an individual, and quite, quite splendid. His waistcoat was of the same saturated color as his coat, and his snow-bright linen with only the barest hint of lace was the perfect foil for his immaculately powdered hair. On any other man such a look might have appeared plain and underdone, but on Strathcairn the blaze of unadorned velvet served to highlight the force of his personality. And there was nothing she liked as much as personality, unless it was a challenge. The earl appeared to be both. It had been exactly five years. He had briefly been one of her eldest sister Linnea’s suitors then—newly elected a Member of Parliament, and headed to London, brilliant and ambitious. Quince remembered thinking the lanky Highlander was too tall, too clever, too canny, and far too insightful for tiny, fluttery Linnea, who adored nothing more than to be made a pet of. Strathcairn hadn’t seemed the type to keep pets. Quince had been little more than a fourteen-year-old lass, but she had quite liked the young man’s intelligence, nearly as much as his vibrant charm. Though what she liked best of all was his lovely, buttery smile that had made her feel like she was melting in the sun. Strathcairn was certainly not pouring the butter boat over her now—his eyes might have been smiling, but from this angle, his chiseled jaw seemed to have been carved out of Grampian granite. He trespassed easily on the old acquaintance by calling her by her Christian name—if Papa’s botanically inspired names for his daughters could even be called Christian. Strathcairn also crossed the lines of familiar behavior by turning her toward the door, and somehow settling her against his side in such a subtle, but insistent, way, that not a person in the place would have suspected she was being all but frog-marched from the ballroom. Even though she was grown up now, and towered over tiny Linnea, Quince still had to leg it to keep up with Strathcairn’s long strides, all the while craning her neck to get a proper close look at him. He looked so different, with his hair powdered white, and this controlled look upon his face, as if his smile had been put away in a cupboard, like a cravat that no longer fit. This new Strathcairn was far more imposing, and much, much more intimidating looming beside her like one of the great statues at Holyrood Palace than he had ever seemed all those years ago when she had keeked out at him from behind the drawing room curtains. By jimble, but he had grown into an even more attractive man himself over the years, despite this polished, urbane facade. Or perhaps because of it—his worldliness gave him an attractive look of experienced wisdom. Quite irresistible. This he acknowledged with a wry sideways slant of his head, as if she were so out of kilter that the acute angle somehow made it easier to see her. “A very bad age to be an accomplished liar. And flirt.” Strathcairn finally released her arm. Much to her chagrin—which was all the emotion she would allow to account for the strange warmth suffusing her face—she found she missed the contact. How disconcerting. “On guard” was too simple and sensible a phrase to describe her reaction—Quince’s skin went a little cold, and that sharp-clawed sense of alarm scratched its way down her spine. But she rose to the occasion—she knew better than most how to put up her weapons. To win any sort of fight, one had to attack, not just defend. And satire was the sharpest sword of them all. Quince’s skin went all over prickly—nothing put her back up like being condescended to. And her with his two buttons down her bodice. She could feel them press into her skin as if they were biting her. Unsurprising since they were his. A fine coloring heat crept up Strathcairn’s neck to his jawline. It lessened that impression of Grampian granite nicely. The moment the words were out of her mouth she wished them back. She’d let her tongue run away from her mind, and run far too close to the truth for comfort. And her suggestion brought Strathcairn’s perilously attentive green gaze back to her. “What an agile mind you have, Lady Quince.” And then for no reason she could fathom, he smiled at her—that gorgeous, gleaming grin she remembered of old. That mischievous, sideways curve of lip that made her feel as if she were being blessedly bludgeoned over the head with a five-penny slab of butter. Oh, by jimble. That sounded far too apt. Heat blossomed in that very place where Strathcairn’s purloined buttons dug into her skin. Oh, he was clever.